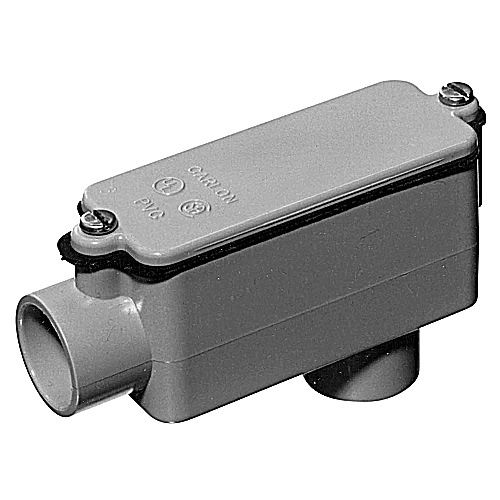 Thomas & Betts Carlon® Conduit body of trade size 3/4-Inch, protects and routes the rigid Schedule 40/80 rigid/IMC conduits through two threadless hubs oriented in 90-degree. This conduit body in gray color, features PVC construction. Type LB conduit body with capacity of 12-Cubic-Inch, offers back side access to the conductors for maintenance and future system changes. It has a dimension of 5-9/32-Inch x 1-3/4-Inch. It comes with cover and gasket to seal out the dust. Conduit body is UL E11461 listed and RoHS compliant.